Event rider Piggy French’s first championship level ride was in 2001 at the young rider European Championships, where she won a team gold medal. Since then she has had great success internationally clocking good placings across the levels, her best 4* result being 2nd at Badminton in 2011. 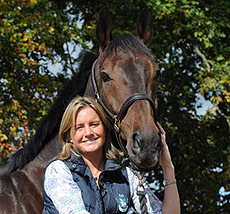 Later that year Piggy went on to secure an individual silver medal at the senior European Championships which followed on from her senior team debut at the 2010 World Equestrian Games. Piggy has been selected for the 2017 European Eventing Championships at Strzegom in Poland with Quarrycrest Echo. The pair finished third at Belton CIC3* in the spring, followed by second at Tattersalls CCI3* and ninth at Aachen CIC3*.